Summer has officially started in our house. We’ve hit the pool, Six Flags, played board game after board game and spent some time chilling out with friends this week. We’re doing what we do best in the summer, and that is relaxing and taking a break from all the running around we do during the school year. It’s so nice to be able to wake up and go with the flow rather than having your day all planned out for you. My friend Andrea sent me her family’s favorite turkey burger recipe a while back after I posted my turkey burgers. She said it was a family favorite and that I should give it a try. Well, we tried these last weekend and they were a HUGE success. 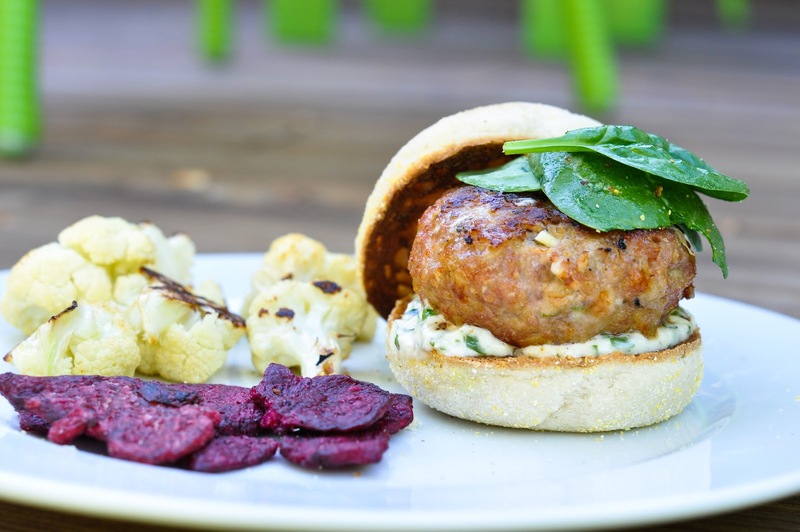 These turkey burgers rock and they’re one of the kids’ favorite dishes now (ranked in the top 5). My kids loved them so much that they asked for them again last night. I happily obliged, as I loved these burgers as well. They are packed with so much flavor from the Gruyere cheese, mustard, scallions and garlic. I also love that the cheese is in the burger! These burgers are now a family favorite in my house as well as Andrea’s, so I am positive that they will be one in yours. You can make this a make-ahead meal simply by assembling the patties in the morning, and covering and refrigerating them till dinner. 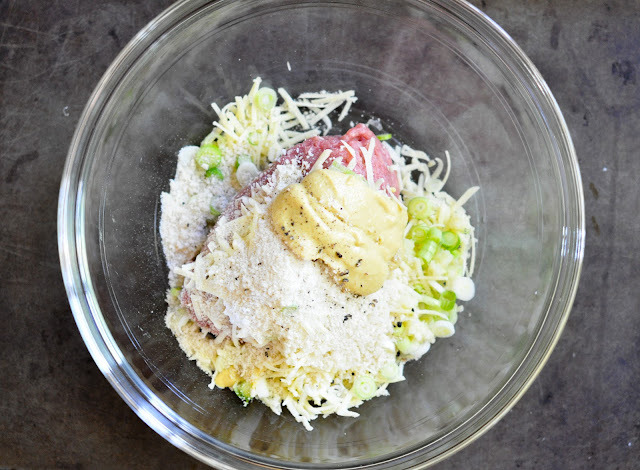 In a medium bowl, gently combine (with a fork, spatula or gently with your hands) the turkey, scallions, mustard, grated Gruyere cheese, breadcrumbs and minced garlic; season generously with salt and pepper. Gently form the mixture into four patties. Note: If you find that your patties are not holding together, then add a bit more breadcrumbs till they do. You can either grill up the burgers, or cook them up in a skillet. If you’re going to cook them up in a skillet, then heat up a tablespoon of olive oil in a large skillet over medium heat. 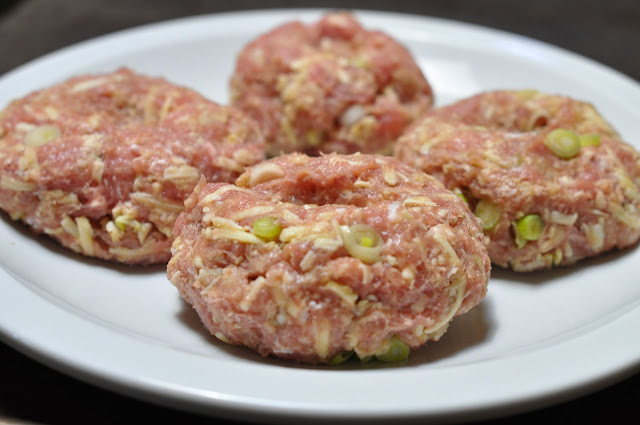 Cook the patties until cooked through, 5 to 7 minutes per side, or until an instant read thermometer inserted in the burger reaches 165 degrees. Andrea’s favorite bun to use is a toasted english muffin, and it’s now our favorite as well. The english muffin retains all the warmth of the burger. I broiled the english muffins with a bit of butter to keep them moist. We then topped these with my cilantro lime mayonnaise and some spinach the first night, and paired them with some roasted cauliflower and these amazing beet chips from Whole Foods. Have any of you tried them? They are so good and so addicting. Another night we topped the burgers with an heirloom tomato, some cilantro lime mayo (of course) and since I was eating some lacinato kale salad, I threw some of that on top as well. The burger was amazing both ways. I mean you could literally top these burgers with just about anything. It’s funny how I always seem to have a vegetarian recipe on Monday and then either a burger or meat inspired recipe on Friday. I guess you can really see that we eat both equally. Like turkey bugers? 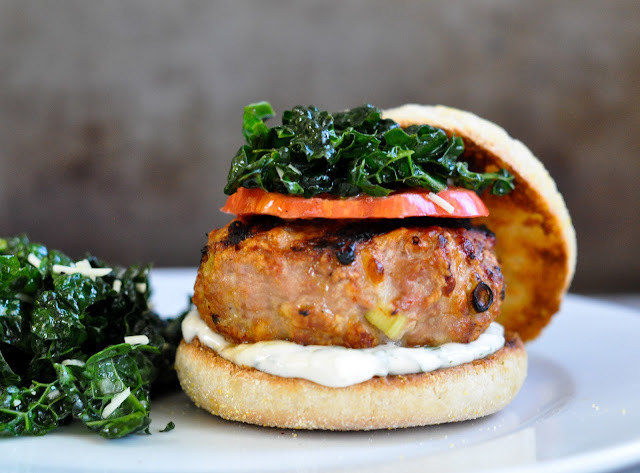 Then you have to try my turkey avocado burger with mint cucumber yogurt sauce. It’s the bomb! O-M-G!! I made these last night and they were so delicious. I’m drooling just thinking about these burgers. I am new to your website – my daughter came across it and showed it to me this week. I have already made your miso tofu with kale meal, your lacinato kale salad, and the turkey burgers. Everything has been delicious!! The turkey burgers are the best I’ve ever had, and my kids love them too!!! Thank you so much for the great recipes; I can’t wait to try more of them. The blog is beautiful too – the photography is incredible! These were so delicious!! I added a few generous shots of Worcestershire sauce to up the umami factor. YUM. Hi Jackie, My sister Kim recommended your blog and my husband thanks you as we have had a week of delicious meals. The parmesan chicken was great and the turkey burgers last night with the kale slaw were a family success. I hope that this finds you and your family well and perhaps our paths will cross when we are out visiting San Fran. These burgers were literally the BEST I HAVE EVER HAD! I’m at college and decided to cook a nice healthy dinner for my roommates and they would not stop raving about these! Wow! What a great comment to receive and what a great roommate you are to make these for your roomies! I wish I had a roommate like you in college 🙂 These are our favorite turkey burgers as well, you just can’t beat them! Have a great night and thanks for stopping by and letting me know that these were such a success! This burger is soooooo good. I made it for my son and he said it was the best turkey burger ever. Very juicy and flavorful. Thanks for the recipe. Thanks for stopping by Nazy. I’m so glad you and Shervin love the turkey burgers. We have Andrea to thank for the recipe! These were delicious! We just finished our July 4 BBQ, and these burgers were a hit – moist and tasty, and super easy to make. The only change I made was substituting 3 tbsp. of quick oats for the breadcrumbs/panko. (I’m trying to deplete a multi-pound canister of the stuff, and I use the oats instead of breadcrumbs in turkey meatballs.) Thanks for sharing this treat! Yaay! I’m so glad you made and loved the burgers. They really are our favorite burger and have now bypassed our favorite buffalo burger. I love that you substituted the oats for the breadcrumbs. I may give that a shot next time. Thanks for commenting! I love hearing back from people after they make a recipe. Wow, these look delicious! Loaded turkey burgers are the way to go – they’re so juicy and flavorful. Even better then beef patties, in my opinion! 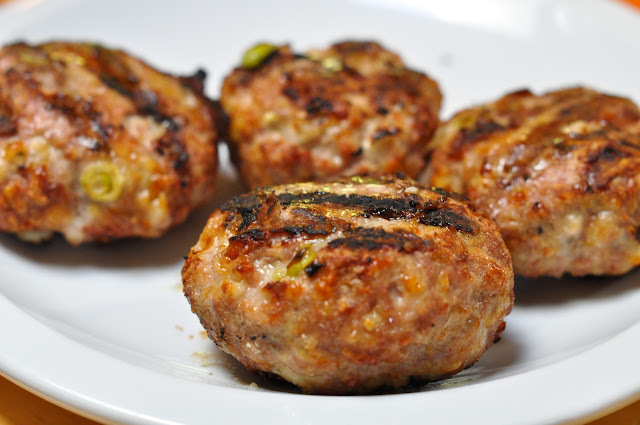 These look great – I’ve tried turkey burgers and had no luck – dried and tasteless – these look the opposite – so glad as I would rather eat turkery than beef – got to try this! Got some ground chicken at the farmer’s market…added a little soy sauce and grilled them up and ate alongside some leftover brown rice and veggie stirfry…what a great recipe that can be changed up in all kinds of ways.. We had a lovely evening relaxing on the deck. That sounds amazing and I love how you changed the burgers up a bit. I love summer and the casualness it brings, relaxing on the deck and watching the sun set. Yum! They look so juicy and flavorful. This is my kind of burger. Lean and flavorsome! I love Gruyere cheese and I can imagine these burgers must be superb! This recipe rocks! We will definitely make these again. Wonderful! oh girl that burger looks to die for! love that you used turkey! Turkey really can be full of flavor with the right ingredients! These look amazing…your photos are gorgeous!!! I especially love the ones on gray…the ingredients and in the bowl. You even make the uncooked ones look good! I’m trying these this week! My eye narrowed in on the those beet chips! I tried making some here. I really liked them alot but P. and the kids were “eh” and only tasted a few. I made some fresh hummus but I thought it would so much easier to buy the beet chips. I checked at Whole Foods but I didn’t see them on my first pass. I’m thrilled you mentioned them here and said that you bought your at Whole Foods…I’m going to look again! Oh, and I KNOW your turkey burger is delicious based on your other burgers! This burger looks so healthy and tasteful! I love turkey burgers! Have you ever made salmon burgers? They’re really tasty as well! These look SO yummy!!! Im so excited for having a proper grill season out here… England does NOT get that – we have a few days when its hot enough to BBQ (just about) but because no-one knows how to do eat we just eat poorly cooked chicken and dubious sausages. I cant wait to give both these and your shrimp a try! I also cant wait for your return and Cheeseboard/ our course. Have a wonderful weekend sweet friend!!! !